Bead Colors- Purple, Turquoise and Aqua with Silver spacers. Measures approx 15" Long. Great photo prop or just to dress up any outfits. Made of Acrylic 20 mm beads and durable stretch string. Secured with bonding glue. 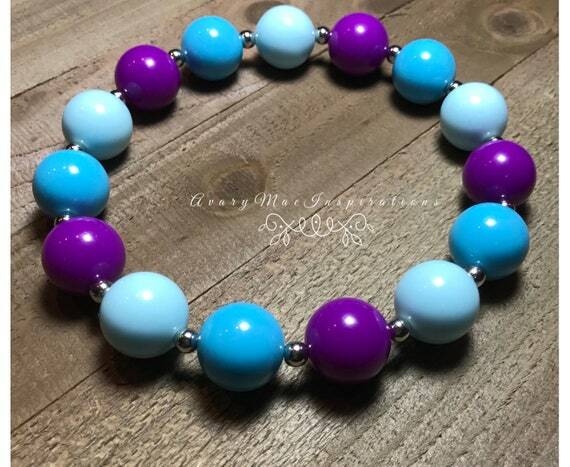 ***Chunky Bubblegum Jewelry- NEVER leave your child unattended with our jewelry. We do our best to make sure that the jewelry is tied very tightly and we use the best durable stretch string we can find but there is always the chance that an item could get stretched to the limit and break and pose as a choking hazard. By purchasing from AvaryMaeInspirations, you acknowledge full responsibility and agree to all terms set forth. AvaryMaeInspirations Assumes no liability for injury, medical issues, or death resulting from product misuse. Supervision is required. Our items are not intended for teething. Only allow your child to wear the jewelry when they are in your sight.